A rally supporting the striking nurses and midwives is going to be taking place in Dublin today. The march, which will allow members of the public to "join the INMO protest", will begin at 12.30pm at the Garden of Remembrance. The march will go to the back of Leinster House at Merrion Square. The march will feature student nurses and midwives with suitcases, calling on the government to give them a reason to stay and work in Ireland. Thousands of people are expected to take to the streets of the capital this afternoon in solidarity with those striking across the country. “We have been deeply humbled by the public support for us during this strike. None of us want to be on strike, but it’s heartening to know that the public have our backs when we do. “I’m asking anyone whose lives have been touched by nurses and midwives to stand with us on Saturday. The INMO have been taking to social media this morning as they shared photos and videos of people across the country traveling up to Dublin to take part in the rally.
? "We'll answer patients' calls! ? A bus full of Munster nurses and midwives! See you at the rally! 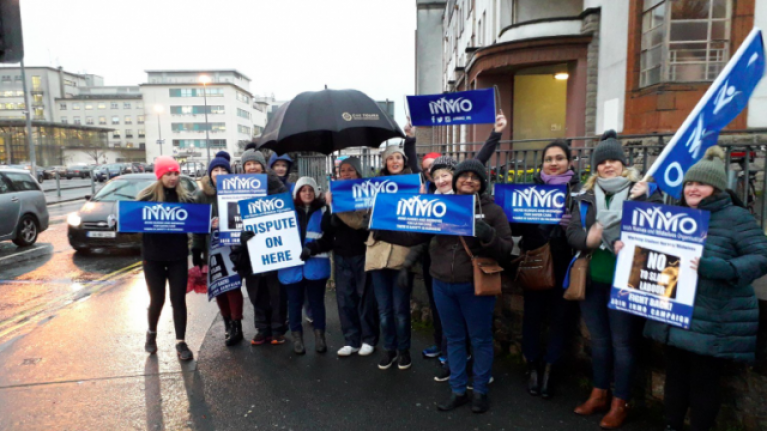 It was announced on Friday evening that the march would still go ahead, after nine hours of talks between the Irish Nurses and Midwives Association (INMO) and the government officials at the Labour Court. The discussions are due to resume around 3.30pm today. Late last year, more than 35,000 nurses and midwives voted overwhelmingly in favour of industrial action. The first 24-hour work stoppage took place on January 30. The second and third strike days took place on February 5 and 7. More dates will take place on February 12, 13, 14, 19 and 21.